You can change how your direction arrow and Enter keys behave in Access. By default, when you press Enter the focus moves to the next field and the contents of the field are selected. When you press the direction arrow keys, the focus moves to the next field in the appropriate direction. If you would like, you can set up the arrow keys to move from one character to the next in the current field, rather than moving focus to the next field. You can configure the Enter key to move to the next record when it's pressed or configure it to do nothing at all. 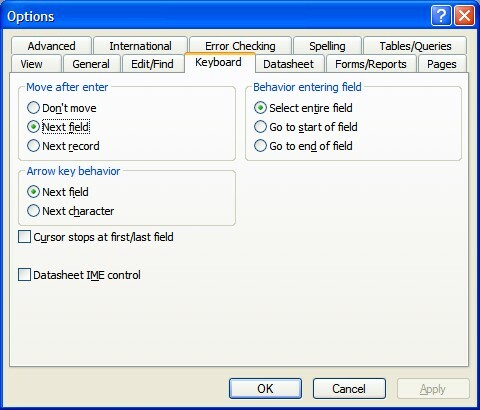 When you do move focus to another field, you have the option to place the insertion point at the beginning or end of the field, rather than selecting the field's entire contents. To modify these settings, choose Tools> Options from the menu bar and click on the Keyboard tab. Make the selections you want and click OK.